If you're new to photo editing, free GIMP tutorials can help you make the most of your image manipulation attempts. Taking advantage of user-developed techniques and tricks that improve your digital photographs is easy and fun. GIMP, or GNU Image Manipulation Program, is a full-featured free alternative to costly image editing programs. Even though GIMP is free, the software provides high-end options comparable to top names in the industry. Just like paid image editors, GIMP supports most types of bitmap graphic files and features similar controls, including image resizing and cropping tools, layer manipulation, masking ability, special effect filters and plug-ins. Now that you know how GIMP compares to other programs, it's time to check out some free Gimp tutorials. Searching the web is the best way to find video and text tutorials. An additional benefit to this type of searching is that you can also find exclusive tutorials on members-only websites and forums. Remove Color Cast: Sometimes poor lighting can give your photos color casts like green or yellow overtones. This happens when improper lighting creates an imbalance between red, green, and blue (RGB) color channels. This tutorial removes color casts on your images and helps restore a healthy color balance. Retro Color: Retro is in and this tutorial gives GIMP users clear instructions on how to get a cool vintage color effect complete with film grain and enhanced lighting. Convert to Black and White: It's easy to remove color saturation from an image, but sometimes the tones shift and leave the photo flat and lacking contrast. This tutorial shows you several methods to achieve a black and white conversion that results in beautiful, harmonious toning. Selective Color: Learn how to convert a color image to monochrome, leaving a single color in place for special emphasis. Like all good software developers, GIMP provides support for all user levels directly on the website. The tutorials featured by GIMP range from simple adjustments for beginner photographers to script writing and web layouts for advanced users. Visit the tutorial page and explore all the GIMP goodies. 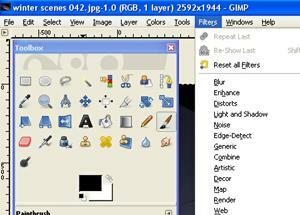 GHUJ GIMP Tutorials: This site offers several pages of tutorials especially for GIMP. Gimp--Tutorials: You can find a wealth of GIMP tutorials for all skill levels here. Gimpology: These tutorials are sorted by submission date and cover a wide array of GIMP image editing. Gimp Talk: This is a forum based resource that features a large selection of user-submitted GIMP tutorials.